Nominal cooling capacity 315 ÷ 1111 kW. 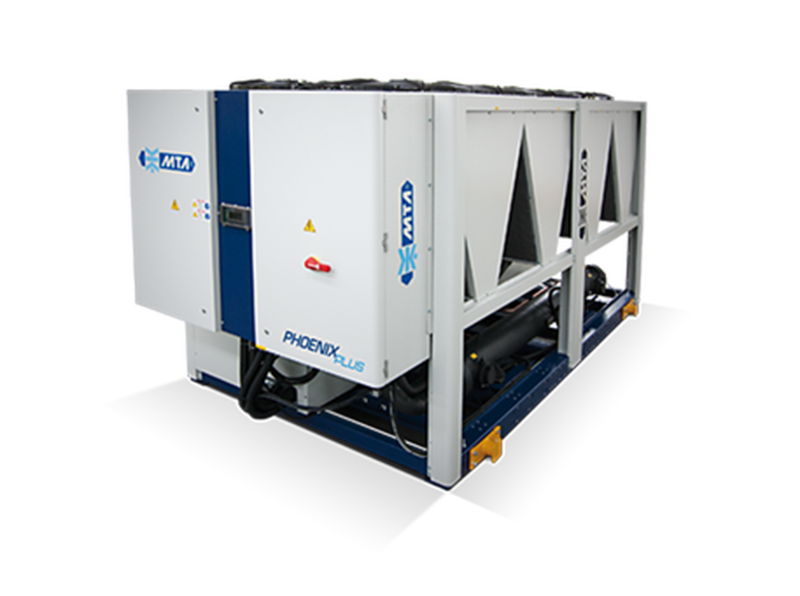 The chillers of the PHOENIX PLUS series, with environmentally friendly R134a refrigerant, represent the best solution for centralised hydronic air conditioning for large areas (such as airports, offices, shopping centres, cinemas, etc.) ensuring best in class energy savings and reliability. This result is obtained through precise design and component selection added to the availability of up to four compressors on independent refrigeration circuits. The screw compressors installed on PHOENIX PLUS chillers are developed and optimized for R134a and thanks to the "Smart Stepless" software algorithm they are capable to deliver the right cooling capacity according to the needs of the system, even in situations of high load variability; "Smart stepless" manages also the oil level in the compressors even in critical situations activating suitable logics. Condensing units are modular, allowing the fans to stop gradually as a function of the instantaneous thermal load, helping to increase seasonal energy efficiency of the units. The management of the units is entrusted to a control microprocessor which operates in total autonomy all major functions, including adjustments, the alarms and the interface with the outside.